I had a pretty much perfect weekend. It started Friday afternoon, when I read that there's a Northern Mockingbird nesting in the area, and went to see. A couple other birders were there, and they helped me find it at first, and then I walked around and saw the parents feeding the kids. Here's a parent with a face full ready to go feed the kid. A friend of mine emailed about taking a bike ride, so we met on Saturday for a ride, starting from a point a bit out of town, and going further out, so that she'd see a new part of the local trail. We were chatting along, and talking about a sort of local famous author's place of birth, so we decided to go in the afternoon. It's about an hour drive away, near a place where I sometimes go to ride my bike up a road to a bakery (weekends only) and then back. Along the way, we passed the turn off to a really great pizza place out in the middle of farms, and we talked about how good it is. We went to the little author museum, and then drove to the bakery, but alas, it was closed. Then we went to the birth site and looked around. We talked about getting ice cream at a creamery not far, and then I had this idea that we could skip the ice cream and go for pizza (and get ice cream there if we chose). My friend thought that was a good idea, so off we went. And it was a very good idea. I think they open at 4:30, and by the time we got there at 5pm, we were #40 on the order list. And before long, I saw a person with #80 pass﻿. It's a fairly long wait for the pizza, even though each takes about two minutes to cook, because they can cook only two at a time in the wood fired stone oven. Sunday, I was sort of frustrated by this dirty carpet in my living room. What with having plants in there all winter, it was gross, and you can see the gross because it's basically off-white. So I decided to do the carpet cleaner thing. I used the cleaning solution twice over the whole area, and also did clear water twice, and by the time I finished, the rinse stuff the cleaner pulled up into the container was less gross than it had been, but still, I bet I could have cleaned it twice more and rinsed it twice more, and there still would have been dirt. But it looks a whole lot better than it did! I'd finished the carpet and was sitting and relaxing, when a couple of friends stopped by out of the blue, so we went out to dinner, and had really yummy Mexican food at a place I rarely remember but really like. This couple lives a few small communities over, about an hour away, so I don't see them often, but it's always nice to see them and chat. So it was an unexpected pleasure for me. Today I've made a huge list of stuff that needs to be done before I go away on vacation. I'm sort of stressed, but I think it's all do-able. And having the carpet cleaner makes me feel a lot better about things for some reason. My facebook feed is full of rainbows today. What an amazing thing, eh? The other night, folks were reporting seeing the Northern Lights in the upper Midwest. And so, last night, when the viewing was supposed to be likely to be good, a friend and I went out to a rural area to try to see them. We didn't. We did play with our cameras and do some timed shots. 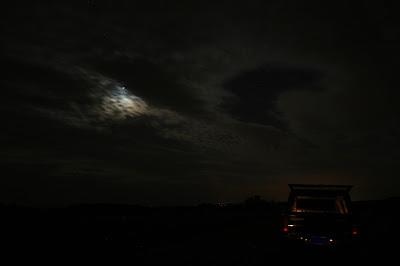 And we played with timed shots with a flashlight moving over a parked truck. Then my friend went home, and I drove about 30 miles north, and got out from cloud cover, but still didn't see the Northern Lights. I did see lots of stars, but even with a slow, slow shutter speed, my camera shots are just black space. Someday, I'll get to see them! I posted here when I was thinking about making my Intro to Lit course include all authors who are people of color. And thanks to all your helpful suggestions, I'm going to do it. As a result, I've been reading some recent works and enjoying the heck out of them. I think I've finally settled on Reservation Blues by Sherman Alexie for the novel, and Persepolis by Marjane Satrapi for a graphic novel. I've been reading Alexie's more recent work, but it's more short stories, and for the novel I want a more connected piece, and I like the way Reservation Blues will let me bring in a Robert Johnson CD or two. Reading these novels reminds me of why I originally thought I'd study recent novels. But that got short circuited when I took two novels courses and a Shakespeare and a Chaucer course in one semester, very early on, and the novels courses (one was American, one British) were sexist and white guy oriented, and the Shakespeare and Chaucer courses questioned sexism and white guy orientation in exciting ways. And here I am. Now, of course, I realize that most of my colleagues' novels courses question and challenge in exciting ways, too. Literature of all sorts has become way more interesting for me than when I was younger and thought I could only be interested in one or two things, you know? I was talking to one of my colleagues in a different program about my idea, and she wondered aloud if students would complain in evals about my literature choices. The thing is, even if they did, the Personnel chair in my department this coming year is a strongly supportive person of color and the general attitude of my department would be that a complaint like that means I've done something right. The department-world has probably changed a lot since I was a student. I'm going to use a bunch of the poetry suggestions you've made in the earlier post, and would appreciate some additional short story suggestions, please. I went to our local Juneteenth celebration on Friday. I hadn't gone before, but this year it seemed important to go, so I did. The emcee started by talking a bit about the Juneteenth organization, and how this celebration got started, and how it represented work by community members to change the community for the better, because we aren't so far from Charleston. There was a prayer by a local (white) preacher, who started with a "blonde" joke, which he tried to pre-excuse by saying that he'd been blond as a kid. I don't know if he doesn't understand the genre (which he introduced as a "blonde" joke) as denoting blonde women, or if he's more aware and trying to sound stupid. The joke would have worked just as well as a "my buddy Joe" joke, maybe better. So that was a bad start, and it got worse; every third word in his prayer was "Lord" and not all of the placements made grammatical sense. And then he ended by praying that those of us who don't have a Christian relationship with his God should get one while there was time before we go to hellfire. So much for inclusivity, eh? Then a teenager read the Emancipation Proclamation, which was really, really interesting, and a local officer from the campus ROTC read a document from a Union officer in Texas starting to enforce it at the end of the Civil War. A (white) county supervisor talked stupidly in that "white liberal I don't mean to be racist but I'm skirting the edges because I don't know how to talk about such things as racism" way. A (white) city councilmember talked blandly. And then there was the picnic. I ate with a couple of colleagues. I'd say about 15 faculty folks were there that I knew, and some staff folks. And that was Juneteenth up in the Northwoods. I took this while the water was drying. Once it was dry, I put the stuff back in, including my kayak and car, and now it looks less tidy than it did, but still way better than when I started. When I was a kid, I used to hate it when my Mom would declare it time to clean the garage. But as an adult, I get to a point where it's just time, and I just do it. It takes a couple of hours, and then I feel way better about it. People have parties in their garages around here, and also sometimes have TVs set up in them. Where I'm from, I don't remember people having parties or TVs in the garage. Do you have parties or a TV in your garage? That was my ride today. I chose a route with a fairly hard start, and then an easier finish. I barely (and when I say barely, I mean barely) made it up the hard start hill. I was ready to be done five miles out, riding back against the wind. I don't know why. I'm reasonably rested, ate decently, drank plenty, and it wasn't especially hot out (about 80F). This summer, I again said I'd help with an assessment task. It's basically the same task I blogged about here and here last summer. Remind me not to say I'll help again next summer, please. Except the extra money certainly helps with summer. Some things are better. The design for entering data is slightly better, maybe two fewer clicks. And the way they've organized the work. Last year, everyone had to have their first 40 pieces done before the organizers reshuffled and we did the next (and last) 40 pieces. This year, they're pre-shuffled and it's set up so that once the person I'm paired with has clicked that she's done with her part, I can do that same one and then enter the data and be done. And they've also cut the days they're giving us to do the project so that we have a week to do each set of 40 pieces. Last year, it took well over a month start to finish, so I was rushed because they hadn't told us about the second half when we signed up. And, of course, some people will put off the work until near the deadline anyway. So, today marks a week since we started, and I've completed my first set of 40 and half of the next set, and I'm going to work on the next quarter of the next set (which my partner has already finished) later today. The first set is due today, so if I get with things, I should be done totally by tomorrow morning. Since I'm an English professor who teaches comp (about half my load), you can probably guess that I'm reading a lot of essay type stuff to do these assessments. It's a LOT faster than grading, in part because you don't have to give any feedback or explain stuff to the writer, and in part because you pretty much have no emotional investment in the writing. Bodybuilding. The students who choose to write about this seem to be already into body building, so they always use their favorite body building websites. And then they moralize about how bad steroids or other naughty stuff is. Food. These seem to be driven by one or two faculty who focus on the evils of eating animals, so the projects are predictably about the evils of meat production, without recognizing the complications of meat production, food pricing, and so on. Princess-type Topics. Whether it's Disney or kiddie pageants, these tend to be really shallow and blah. One I read sounded like it was an excuse to rewatch every Disney movie the student had loved as a kid. Disease of the Week. These are pretty variable, to be honest. They tend to use WebMD type sources, and most really aren't scientifically informed enough to read actual science papers, so they never get very deep. I think they could do okay with flu, but they don't pick flu. Surprisingly, I've read a couple topics where students seem able to dig in and do well. I've seen a couple projects on issues about paying college athletes that were well done. So far, none of the projects are on abortion or legalizing marijuana, and the one on gun control was actually pretty okay. I haven't had any on tattoos or piercings this time around, thank dog. But contingent folks teach 5/5, with a steady diet of introduction to underwater basketweaving, and only the occasional intro of first/second year course, depending on their "specialization" and the curricular needs. Would the teaching intensive folks retain the 5/5 load and add service and advising requirements? Would they retain the focus on intro courses? Fie Upon This Quiet Life responded here ("Teaching Track Solves Nothing"), arguing that teaching intensive schools already have teaching intensive tenure tracks, and that "research creep" means these schools also require research (and service, of course). We are asking our colleagues ramp up the pressure already on administrators from collective bargaining to refuse the creation of new adjunct appointments (forcing administrators to invest in good jobs if they want to expand) and using the many channels of shared governance to force change. Fie responded, arguing that faculty in her school don't have power, and citing large cuts to eliminate majors at her school without faculty governance and participation. Fie further added a blog post ("How do you solve a problem like the bottom line?") thinking about cutting general education to solve budget problems. She also explained that her department has been working with administration to develop "the conditions under which contingent faculty could be granted long-term contracts and the creation of a system of annual review where there had been none before." I will only note that although the provost holds out the possibility of a specifically tenured teaching position, it seems increasingly likely that this chimera will only be available to superstars who are otherwise of value to the university. In short, the normalization, over the last few decades, of using (and increasing the numbers of) adjunct and non-tenure-track instructors, at practically every college and university in the land, has had the effect of suggesting to outside observers—indeed, I’d say it suggests to anyone who thinks clearly about the issues—that collegiate education can be accomplished more cheaply and without tenuring the teachers. And yet, in my experience, tenure-track faculty often seem to work harder to justify their higher position in a two-tier system of instruction than they do to work for the benefit of those caught in the lower (non-tenure-track) tier. It has sometimes felt as if they are concerned to police and patrol that border that separates tenure-track from non-tenure-track with particular diligence. people in tenure-track positions accept the existence or necessity of non-tenure-eligible faculty lines, then they have already accepted that tenure is not really necessary, and they risk reducing the effect of their own arguments to “But tenure is really necessary for me, and for those like me”. Likewise with salary, and with teaching load: “Oh, I’m in a tenure line, I need to teach fewer classes and get paid more because my teaching is linked to my research.” As if some teaching need not be linked to research, as if teaching twice as many courses a term should not be expected to affect the quality of instruction. But if reasonable pay and teaching loads are good for some, why not for all? There's been more response to his argument in the comments to Historiann's post where she's taken a look at her own department's practice of not hiring adjuncts to tenure track positions in national searches; she notes that the adjuncts apply, and make it to the finalist stage, but then aren't ranked as highly as someone else who's offered the job. Edited to add (with apologies for not seeing it earlier): Undine over at Not of General Interest has also posted ("The Economics of Wishful Thinking About Campus Funding") with a scenario about what might happen if faculty in one department at one school decided not to hire contingent faculty to staff sections and taught fewer sections; she posits that the administration would do an end run, covering the sections with MOOC type courses, for example. As I read over these, I see a lot of complications. R1s, regionals, SLACs, and community colleges provide very different experiences for faculty, contingent and otherwise): teaching load, research expectations (creep? ), support, resources for research and teaching. Private and public also matters. Unionization seems important, perhaps the most important issue in many ways. I wonder how important it is to us whether contingent faculty are hired via national searches or local availability. I think that some folks in this conversation think of contingent faculty as having terminal degrees (PhD or MFA), while others think in terms of MAs. Are contingent faculty required to do service some places and not others? Most of the voices I'm seeing are tenured folks. Tom (of Chancery Hill Books) talks about leaving his tenured position to follow his wife to her tenure track position ("Post Academic: You Must Change Your Life"). While that's admirable, it raises issues of how marriage affects decisions. Single people may have different considerations, as may partnered people without privilege of marriage. I also wonder how race works in these conversations, urban vs rural, too. I've finally put the rest of the plan into the garden. I've added carrots a while back, and yesterday added some summer squash, zucchini, and a couple of pumpkins. As you can see here, the kale is doing well (and I've harvested a fair bit of kale already, and spinach, and some lettuce). And, yes, I have a nice crop of weeds. On the left: front is strawberries, then carrots (small, but growing). The next bed is a pumpkin in back, and either summer squash or zucchini towards the front. I emailed some colleagues the other day to suggest that we get together to celebrate a beautiful summer week, and was surprised to get an email back from one saying that he and his partner were gone for the summer. This doesn't sound like a research trip, or a trip of any sort, more a moving away for two and a half months. Nor is it spending the summer to be with a partner. It's clear to all of us that this colleague wants to leave, and we're all rooting for him to get the perfect job that he loves somewhere. Leaving for the summer seems to me that it would make being here for the school year all that much harder. Summer here is pretty darned good. No, there aren't museums or amazing concerts or stage productions right here, but there's stuff within a couple hours drive. And there aren't great sights to see, or the best national parks. But I don't think that's why he's left. It seems sort of, I don't know, undergrad? Like, I'm going home for the summer? Except I don't know if he's going to be with family (though he's going to the area where he grew up, I think). The thing is, to me, summer is a time to get to know the area, to get to know people you don't know from work. There are softball leagues, biking groups, free concerts, all sorts of ways to enjoy the community as a community. For me, it's a time to do things I normally don't have time for, and to do summer things, especially, and doing those things makes me happier with the community overall. I'm not being critical, just curious. Why leave for the summer? And how to manage that financially? Fie Upon this Quiet Life blogged today about the recent Chronicle of Higher Ed article by Michael Berube and Jennifer Ruth. In their article, Berube and Ruth talk about the central argument of their new book, "as a way of undoing the deprofessionalization of the profession of college teaching, a teaching-intensive tenure track for nontenure-track faculty members with Ph.D.s and good teaching records." What they're proposing specifically, it sounds like, is that folks who've been adjuncting somewhere for 7 years should be grandfathered into a tenured position, so that they couldn't be fired on a whim. If someone's been in place for 7 years, then the school has basically found it necessary to rehire them again and again, so it has need of someone in a relatively permanent position. And if the school's rehired the same person, then the school's basically decided that their teaching is good enough to qualify for rehiring. So in that way, Berube and Ruth's argument makes sense. I didn't see Berube and Ruth arguing that these people should be paid the same as regular "research" tenure track faculty, though they should get benefits. Berube and Ruth do argue that only folks with terminal degrees should qualify. Presumably, though, they think most teaching intensive track positions will be new hires from national searches (at least, that's the implication I get from the article, since they argue that PhD is important in re-professionalizing the profession). Fie's take on their proposal is that we already have a teaching intensive tenure track, and that it's pretty much every tenure track job at teaching intensive schools such as her own, where most faculty teach 4/4, and yet administrators still hire adjuncts to save money in providing teachers for courses. Fie notes that her department relies heavily on adjuncts. Fie also notes what she calls "research creep." That's something I recognize in my own department, where we're teaching intensive (11 credit hours/semester, generally) but still require and judge people based on research. And we value research on balance with teaching. Teaching is the first category in our reappointment letters for tenure track faculty, but someone without decent research is going to have a really difficult time getting tenure or promotion. And yet, I've heard colleagues suggest that we should make a new "teaching" tenure track, where we wouldn't require research. But the implication is that the faculty member would teach 15 credits a semester and have service and advising obligations. Currently, our adjuncts count as full time with 15 credits and no service or advising obligations. The thing is, almost all of my colleagues want to do research. We love the occasional grant to get reassigned from teaching a course to do research. We all go to conferences (often on our own dime) and most publish, some with amazing results. So even if our personnel decisions didn't emphasize research, we'd still want to recognize the work people do. (Heck, we're not legally allowed to consider research or service when we evaluate adjuncts, but we can't help noticing the amazing work some of our adjuncts publish.) And anyone who wants to move from my school (right now, pretty much everyone here) needs to have a strong publishing record to stand a chance on the market. I have two additional concerns: one has to do with the classism I see in academia, where upper class schools with high salaries, low teaching loads, support for research and such hire almost exclusively scholars trained in a small number of very elite institutions, and those elite institutions accept graduate students almost exclusively from mostly elite private R1s or SLACs. I fear that the "teaching-intensive" track will be reserved for those of us who didn't come from the right upper class undergraduate background even more than it currently is. The second concern has to do with gender. Women may get more undergraduate degrees than men, and may get more graduate degrees than men, but men get more jobs and more money for those jobs. Will women be limited to the lower paying, less prestigious "teaching-intensive" jobs? I bet so.